Introduced in DC’s New 52 continuity with Flash Annual #3 in 2014, Wallace “Wally” West (II) is the newest addition to the main Flash Family. The New 52 relaunch of the DCU had in large part retconned many well-known characters that were staple members of the speedster family and changed the origins of others. The original Wally West (who was also a Flash) had been completely wiped from existence, and it wasn’t until the aforementioned annual issue that DC gave readers a character with the name “Wally West.” While many who had grown up with the original cried foul at this move, the character nonetheless gained his own following (albeit a much smaller one at first), and he also received an amalgamation of this particular iteration being presented in the hit The Flash television series on the CW network. New 52 Wallace (“Wallace (II)” for the sake of avoiding confusion) has probably the most unnecessarily complex backstory – or at least right up there with Bart Allen’s – and his introduction and early utilization in the continuity continues to dilute his potential success in the series. But let’s break it down starting with his family: Wallace (II) is the son of Daniel West (though first both he and the readers are informed that Daniel is his uncle; this was later altered to the former when Geoff Johns took over the title in DC’s Rebirth), who is the Reverse Flash (III), also introduced in the New 52. He was portrayed early on as a disobedient juvenile, and very much a delinquent teenager stereotype, as a result of his mother going missing in the aftermath of the Crime Syndicate wrecking havoc throughout Central City. Following this and his “uncle” (as he knew him) Daniel being locked up in Iron Heights for his crimes as Reverse Flash (III), Wallace (II) was taken in by his aunt, Iris West. Despite Iris’ best efforts, Wallace (II) continued to act in a rebellious manner and found himself arrested after refusing to take the Flash’s (Barry Allen) chance to run away from a shoplifting incident in which he’d gotten himself caught up. The resulting arrest proved to be a positive for Wallace (II)’s growth as a character and a young man, as he got the chance to visit Daniel, whom he had idolized since his father had long run off on him and his mother. Daniel explained to Wallace that he needed to serve his time inside Iron Heights for the crimes he had committed as Reverse Flash (III), and entreated Wallace (II) not to make his same mistakes and end up in prison himself. With Daniel West’s words in his mind, Wallace (II) started to come around to both his aunt Iris as well as Barry Allen, to whom Iris had introduced him, and began to leave his delinquent past behind him. 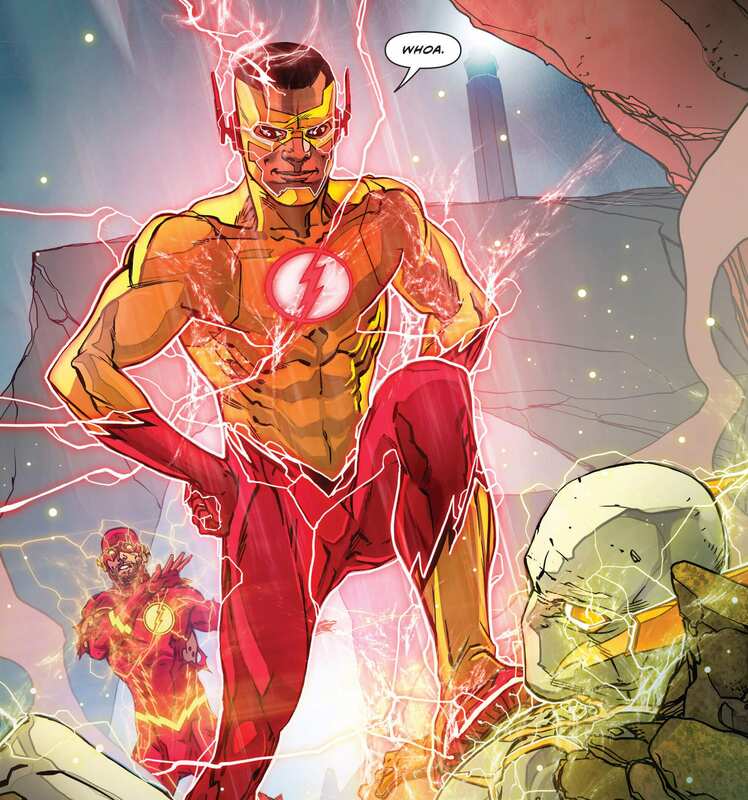 Wallace (II) first gained his connection to the Speed Force when an alternate future’s version of himself used his dying breath to send his powers through time to his younger self. Now imbued with a connection to the Speed Force (though it was a volatile one at first), Wallace (II) – though he experienced much difficulty in his attempts to control his newfound powers – vowed to protect his aunt and help his new idol, the Flash. This led into DC’s Rebirth event and the subsequent Speed Force storm in which dozens of Central City’s citizens were struck by bolts of Speed Force lightning and granted connections to its energies. With help from one of the S.T.A.R. labs scientists, Meena Dhawan (who had also gained a connection to the Speed Force through the storm), Wallace (II) eventually learned to better use his powers and was able to assist the Flash in defeating the Speed Force-stealing villain Godspeed. He then was taken under the tutelage of the Flash and took on the mantle of Kid Flash (the third one). Like the Kid Flashes that came before him, Wallace (II) became a member of the new Teen Titans after the newest Robin, Damian Wayne, kidnapped him and other former Teen Titans members. Kid Flash and the others assisted Damian in a battle against the League of Assassins before formally forming themselves into the New Teen Titans, and he grew quite close with the group’s resident spellcaster, Raven. Not long after joining the teen superhero group, Wallace (II) was kid-Flash-napped by none other than Slade Wilson (Deathstroke), whose goal was to siphon the Speed Force out of the youngster so that he could go back in time and prevent his son Grant Wilson (Ravager) from dying after getting involved with H.I.V.E. Having been tricked by Wilson, Wallace (II) helped Deathstroke obtain Speed Force powers and unwittingly became an indirect cause of the original Wally West getting a damaged heart (see DC Rebirth’s Titans: The Lazarus Contract). He was subsequently kicked out of the Teen Titans by Robin for his rash decision. 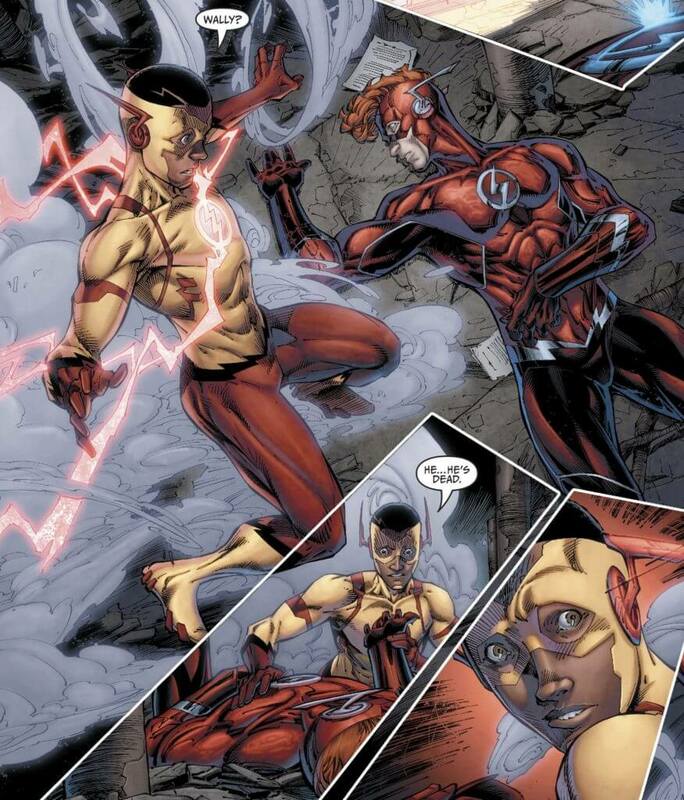 When the consequences of the aforementioned mini-event came full circle and Wally’s heart gave out as a result of pushing himself too hard in a battle against the future version of his Titans teammate Troya, Wallace (II) arrived and used their mutual Speed Force connection as a defibrillator of sorts to restart his heart in atonement for having partially caused it to stop in the first place. As a Speed Force Conduit, Wallace West (II)’s abilities include all of those inherent to other speedsters that tap into its energies, such as the aura that protects against the immeasurable levels of friction generated from moving at such high velocities, accelerated healing, enhanced reflexes, stamina, and awareness. His phasing still needs work, and of course the super speed (no kidding, right? ), but he also has learned to use his powers in ways that some of the others have not. This includes: LIGHT PROJECTION that allows Wallace (II) to create piercing, blinding light (think strobe lights) by manipulating his Speed Force lightning, an ELECTRO-BLAST that is a bolt of Speed Force lightning that he can use as a projectile, and SPEED FORCE NEGATION which allows him to temporarily “short circuit” other speedsters’ powers by matching up and interlocking his own Speed Force energy with that of another. 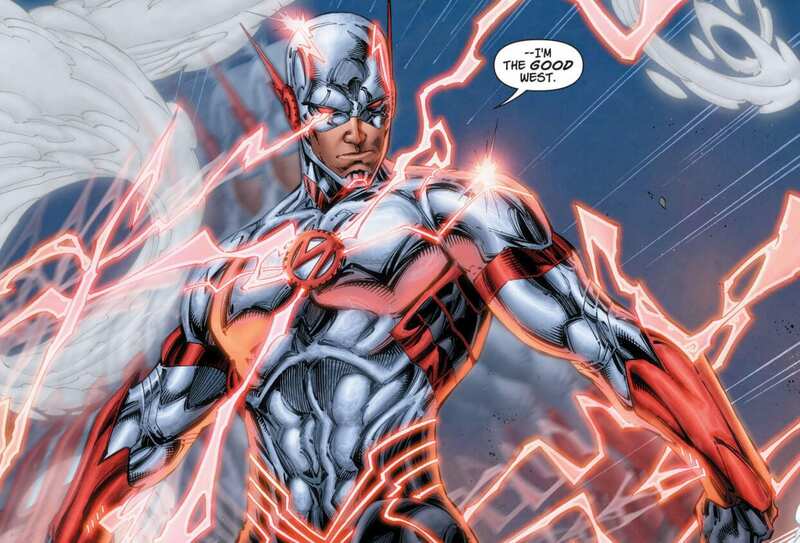 This latter ability enabled Wallace (II) to negate the Negative Speed force corrupting Barry Allen. Where his speed is concerned, Wallace (II) is presently the slowest of the current Flash Family. However, with the conclusion of Joshua Williamson’s Flash War (DC Rebirth’s The Flash Annual #1: Flash War Prelude, and The Flash #47-51) event bringing with it the return of the speedster with an attitude, Bart Allen (no, not Sonic the Hedgehog), Jay Garrick’s status still in limbo, and given the peak of his future self, it’s difficult to say with certainty where he will ultimately end up on DC’s speedster list. Wallace West (II) still has a long way to go to earn his place amongst the great speedsters who have gone before him, but he’s come a long way in a short time. Nevertheless, his inexperience (comes with the territory of being the new kid “Flash” on the block) stands out even with the growth that he has had over the last few years, with his teenage immaturity manifesting itself far more often than is necessary. As DC Rebirth continues down its current path, time will tell if Wally will reach the place that his future self had (errr…will? Time travel man…) or if a different destiny awaits along his life’s course.